Easton LaChappelle has been taking apart things since he was a child and is now changing industries. 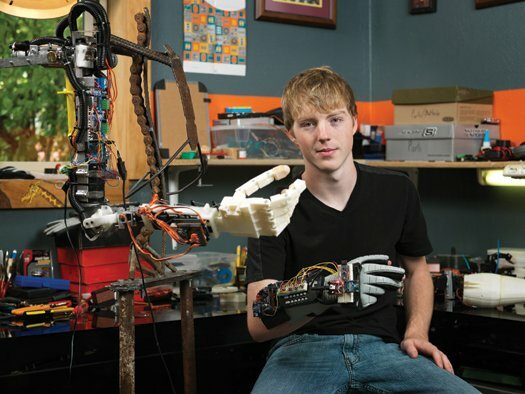 At 14, he made his first robotic hand out of LEGOs, fishing wire and electrical tubing. 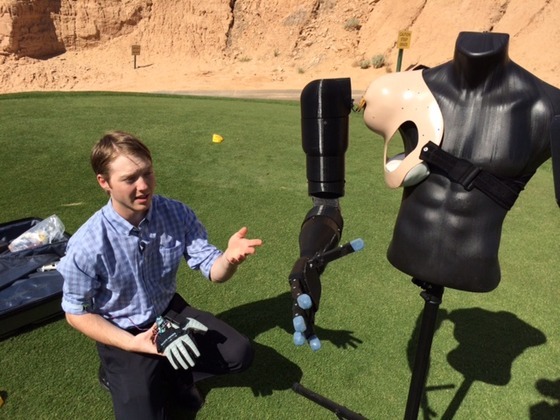 With his gradual improvement, the hand turned into an arm and advanced to a 3D-printed brain-powered invention that he could operate with his mind. After an encounter with a 7-year-old girl at a science fair whose prosthetic arm cost $80,000 (and would need to be replaced when she outgrew it), LaChappelle was inspired to turn his prototype into a practical and affordable device. Not only were his designs amazing, but his young age in addition to his self-taught knowledge of robotics started to make an impact. President Obama shook hands with one of his arms and has traveled the world spreading the message that you can learn outside of the education system including a TED talk. 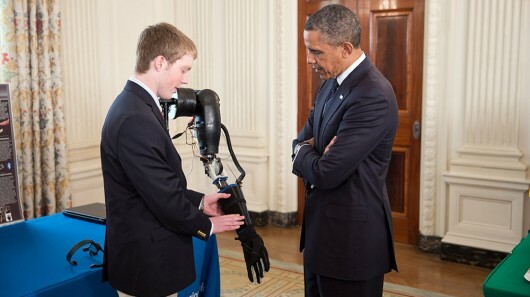 He’s worked at NASA on the Robonaut project developing a new tele-robotic interface. At 18, Easton founded his own company, Unlimited Tomorrow, Inc (UnlimitedTomorrow.com). They are developing a new concept of an exoskeleton to help paraplegics walk again, have filled patents and are pursuing FDA approval. 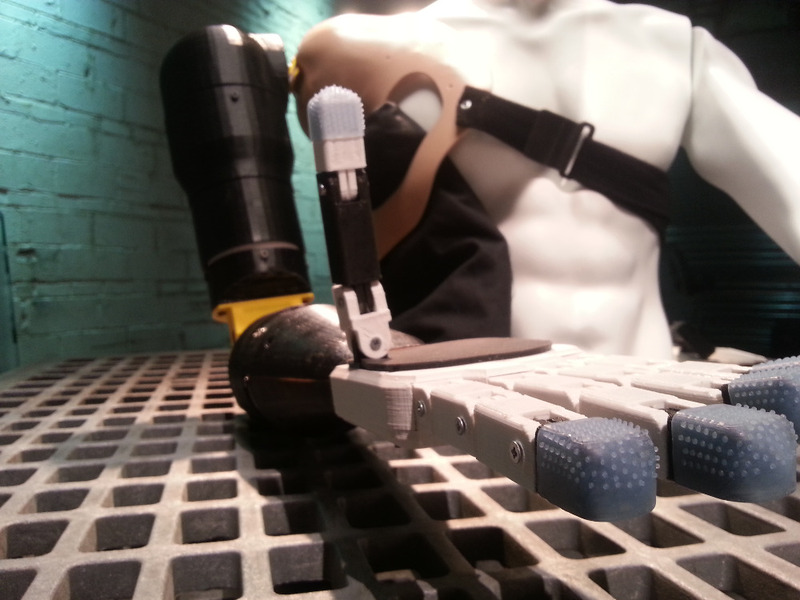 The company is also creating advanced open source robotic arms that can be used from prosthetics to a STEM learning platform. Both of these products are considered disruptive by the way they impact multiple industries with a better alternative. Unlimited Tomorrow's philosophy is to keep the user first and to give extreme technology at an affordable price. I am raising money to expand our resources which includes more 3d printers, material development, manpower, and testing equipment. This will all help contribute to getting this technology to the people who really need it. We will be keep this process personal and highlight individuals along the way. We've crossed the half way mark!! Thank you to everyone that has donated. On February 18th we will be on the new show "All-American Maker" on the Science Channel with something brand new! Huge thank you to the contributions so far! We have some big plans to start implementing this into the education system with some very exciting partners. My husband was electrocuted the day before his birthday 9/13/17 right shoulder and arm is gone left arm 7 inches left. Can you help If you have money? Please contact me by private message. Wow you actually brought me to tears... you are truly an amazing person. Such a rarity someone places individuals before riches. May God bless you and your work! Much love and respect! Any body with this skill could make millions of dollars in this industry, instead you chose to share it with humanity and put a very low cost. Everybody wants to do something good but noone seems to take action. Your reward will be given by God by making so many people happy and hopefull. I cannot thank you enough. I am %100 sure you will create more for other body parts. Our prayers are with you! Wishing you all the best and all the luck in the world!!! I know my friend Teddy made a contribution to your fund earlier -- He needs help too, but wears his heart on his sleeve and is very compassionate. Maybe you could check out his campaign? Thanks!! Love and Peace. After seeing a story on the Albuquerque news about this amazing young man, I tried several times to post this on my facebook timeline without success. Is there a logistical problem on your end? Wow! Ethan, I'm sure you are aware of how amazing this technology is and that you without a doubt is going to change the lives of millions. I am a congenital Right BE amputee and wore a prosthesis from 6 months old until 13 years old. I found that the few things my prosthesis helped me do did not out weigh the loss in Range Of Motion and the discomfort of carrying around a 5 pound Myoelectric prosthesis. I am a Nurse in Alabama and have had to over come a lot of limitations in my chosen field and unfortunately one is not being able to wear my prosthesis at all. The technology avalible is not functional. Your invention could change that. My husband is also a Right BE amputee as a result of a motor cycle accident. He works in Structural Engeeniering and wears a prosthetic hook he struggles with fit as well as range of motion.. We are lucky in that we have been able to adapt. But not without years of struggle as well as trial and error. Future amputees will be spared this struggle because of you. I cannot express how amazing your invention is, and even for myself and my husband as "functioning amputees" gives tremendous that future technology will make life easier. This is exactly what my 48 yr. old son needs, arm and hand. I have started a gofundme for him as he can't get good employment since he only has one hand. His left arm was lost in a roll over accident. I am so proud of you for doing this work to help others. Hi Easton! I am so wanna be a part of your efforts in changing this world. I am a Chinese and if you need an interpretor maybe you can consider hiring me? :D Hire me as your assistant or sidekick or whatever plz? I so wanna help! If you want to set up a branch of your company in China I will work for you for free! 7 year old fan of 3-d printers, robotics and humanitarian aid wishes to contribute from his piggy bank savings. Keep up the GREAT work. Join Bill Gates & Warren Buffet foundation. Run for President when you are old enough!